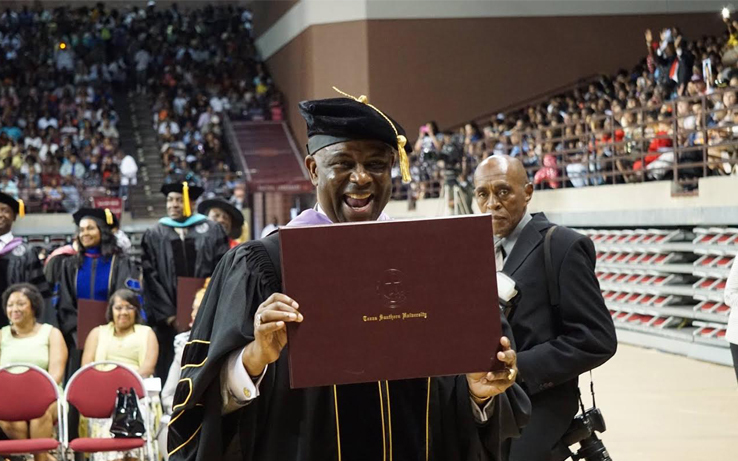 Student Minister Robert S. Muhammad, who serves as the Southwest Regional Representative of the Honorable Minister Louis Farrakhan and the Nation of Islam, received his PhD in the fields of urban planning and environmental policy from Texas Southern University at a graduation ceremony held this past Saturday, May 14th at the H&PE Arena. Muhammad, who is known in the community as a community activist, civil servant, scholar, urban planner, and radio talk show host, is an extremely engaging and influential personality in the Greater Houston area. Born in New York and raised in Harlem and New Jersey, Muhammad is a graduate of Hampton University Class of 1978 and is a member of Groove Phi Groove Social Fellowship. He is a radio talk show host on www.kpft.org / Connect the Dots 90.1 FM each Wednesday from 3-4 pm CST. He is married and the father of four sons. The Forward Times congratulates Dr. Robert S. Muhammad on this major personal achievement.